Welcome to Handmade Monday! Just a quick reminder for everyone: please only leave one link to your blog per week, please visit and comment on some of the other blogs if you can, and please link only to blogs (not shops or Facebook accounts). More info here. I'm also working on my line drawings for digital stamps - I expect to be able to have a few of these ready for download in the next few weeks. I'm trying to make life easier for myself and work on A4 paper so it's easy to scan! I obviously have a bit of a thing for shed shapes! 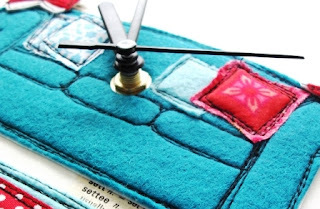 There was also good news on the sewing/design front - remember the sofa clock? They're using it again in another magazine so are paying me again for it. How lovely! It isn't as much as the initial fee (it isn't very much at all, actually!) but it does feel rather nice to have a surprise payment for something I've already been paid for once! Lovely drawing and great news on the clock! My Mum always uses Promarkers for her card making ans she swears by them. Great drawings! Nice bright colours from the Promarkers, not heard of them before. Congrats on the sofa clock feature! As it has taken you no more time any extra money is surely a bonus. Congratulations :) Loving the bright colours on your art work. With this dull weather nice to see a bit of colour. Those colours look really vibrant! Congrats on the bit of luck with the sofa clock. I love those images, a hint of summer days...if only! Love the drawings, you really are multi talented! Great news on the clock payments and the magazine exposure. Pro markers are great to work with, you can get such a lovely range of colours. Great news about the clock! Being paid again is a bonus. 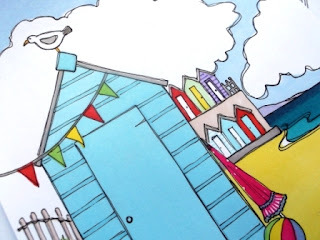 Love the beach hut and congrats on the second mag feature of the sofa clock (not surprised - it's lovely). Well done on having another feature in a magazine, not suprised really your work is lovely. I love the sofa clock! I love the shed drawings. You are so talented !!!! Great news about your sofa clock. Well done on the surprise payment - all payments are welcome, but surprise ones even more so. 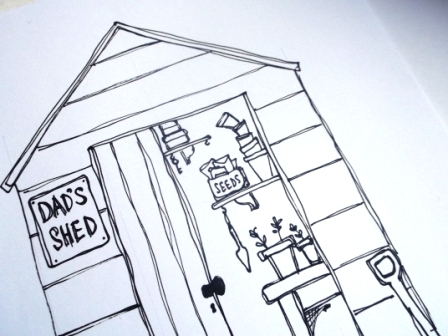 I love the shed drawing. I have always felt I should give Promarkers a try, never have but I might have to re-think that. Hope you have a good week. Oooh i love the marker drawing! V tempted to have a go with those, the colours have come out so beautifully! Great news on the clock payment. Every little helps! Love your drawings, especially the shed one... and you are right the colours are gorgeous! I have heard of the promarkers, I think I shall have to get some. If my little drawings came out anywhere nearly as good as yours I would be very happy! Congrats on your second sofa clock feature too!